“Come this way, hello! Come this way,” yelled someone from inside the house while we were parking the car, indicating to us that we should use the garage door and not the front door. As soon as we enter the house Nancy hugged each of us so effusively as if she has known us forever. ¨Hola, corazon de melon,” she told me in such a familiar way that I felt homesick for my native country Dominican Republic. Loosely translated, it means ‘Hello, sweetheart.’ Then came the scolding: ¨Oh, it´s so easy to get here. I can´t believe you ladies got lost.¨ I was expecting it; it’s never OK to be late for an interview, nonetheless for an interview with a former journalist… and journalism professor. We sat at the porch in front of the bay where we could see the boats and, farther up, the Howard Franklin Bridge. Nancy opened one of the windows so we could feel the breeze. Between ham sandwich bites and iced tea sips, came the question: ¨OK, what do you want to know about me?” Nancy said looking me straight in my eyes. ¨We want to know you,” I replied. We had read plenty about Nancy before. She was an HCC mass communication professor for more than 30 years and retired five years ago. Although she is no longer the teacher and adviser, but an important part of the history of HCC. Nancy was the pioneer behind all the student publications. Under her advice, students created the yearbook Satori, the newspaper Lucerna and the literary magazine Reflections and Introspections. Those publications later became The Hawkeye, Galeria and TRIAD. She has won many awards throughout her carrier. Among those are Italian Woman of the Year in 2002 and College Media Advisers Hall of Fame. At the time she received her last award, Nancy was the only community college journalism professor to win it. 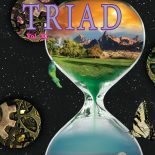 Her story had been printed in the pages of TRIAD so many times that it seemed almost redundant to write about her again. However, there is a part of Nancy that was not displayed in those stories— the human part. She has an explanation for it: ¨The students wanted to write about me, but I never let them because I was the teacher,” she said. ¨I wanted them to write about something else; about what was happening in the world; about what was happening around them.¨ According to Nancy, the stories that have been printed about her were written without her total agreement or collaboration. She said that they fired her on Friday, hired her again the next Monday and promoted her a week later. ¨Then HCC opened and they came after me, ¨ Nancy said. By that time, HCC was in Hillsborough High School’s back yard. ¨I used to love it. It was great,” she said of those times. ¨I remember when we marched. We wanted to be part of the 60´s scene. We marched around the school with bands on our arms, carrying candles, in protest for the Vietnam war,¨ recalled Nancy. While a college student, Nancy worked as a news reporter for the Tampa Tribune and also wrote for the Tallahassee Democrat. She already had experience when she came to teach at HCC. Nancy then took us inside the house and showed us her wedding picture hanging in the hallway. There were Nancy and Paul, a gorgeous couple, walking down the aisle. The picture reflects such happiness that it looks like a movie setting. Nancy and Paul had two children; a boy and a girl. Their pictures, too, are displayed all over the walls. Nancy said that although she always valued her family over anything else, her children were sometimes resentful of her time-consuming job. ¨Sometimes they told me, ‘you are not married to our dad, you are married to those publications’,” she said. She feels so proud of her work with the student publications that she didn’t take anything home for herself. ¨I left everything in there because that is the history really,” said Nancy. The interview could not be complete without asking Nancy what she thinks of the student publications now. ¨Those publications are my legacy and I like what you are doing with them. You all are really gifted.¨ she said. ¨Do you want to go out this way now?¨ Nancy asked, opening the front door. She waved good-bye to us and said, “You ladies be careful and don’t get lost,” she told us as we laughed.